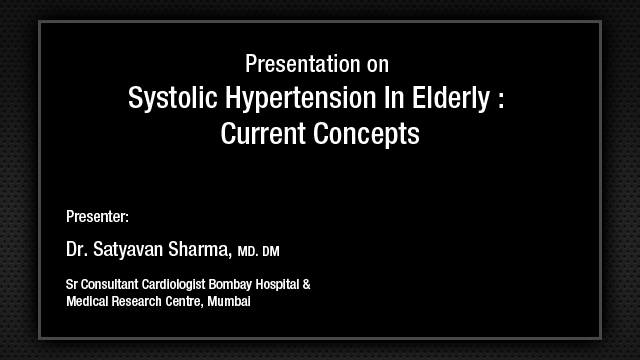 Date: 25-04-2013 Do we need guidelines for Hypertension ? Unfortunately our president of the Hypertension Society of India, Dr. Wander, due to personal reasons could not attend this very important midterm conference and he has sent his regrets and he has instructed me to talk something about topic that was assigned to him and as you all know that API has rolled out the Indian Guidelines on Hypertension, the third edition, and we, core committee consisting of myself and Dr. Sandhya Kamath, Dr. Wander, Dr. Munjal; you must be realizing that this core group is from all over India. We represent each part of India, East, West, North and South and Central and we have Dr. Sukumar Mukherjee, we have a young postgraduate in Cardiology, Dr. Mihar Mehta to assist us. Dr. Falguni has given her inputs and we deliberated whether to come out with these guidelines and as you all know, the second guidelines were released in 2007, that is almost 5-6 years ago, and we were keeping in pace with JNC 7 and we were thinking of bringing out this guidelines and someone had commented yesterday, the need for bringing out the guidelines even before JNC 8. We were hearing that JNC 8 is going to come for last one and half year and we were planning our release of our guidelines in 2012, but it did not happen, so ultimately we thought that we are talking of Indian scenario and that is why we need the Indian guidelines on hypertension and that is why we have rolled out this guidelines for you all. I think most of you must have gone through these guidelines and as you all know that about 1 billion of worlds adult population had hypertension in 2000. Imagine 1 billion, almost as much as population of India, and this proportion will increase to 29% that is 1.56 billion by 2025, and that is why as I said yesterday the population of hypertension India is 80 million plus. This prompted us to bring out the third edition and various other reasons, which I will come to and that is why we thought that we should bring out the guidelines. Every third individual is going to have hypertension in India by 2025, and as I was discussing with Dr. Murlidhar Rao that we have not addressed 2 complications of hypertension in this conference, which we will do in subsequent meetings and you all know about the cerebrovascular accident. Among the hypertension the most important complication is the cerebrovascular and kidneys apart from cardiovascular involvement and the cardiovascular involvement is in association with the kidney involvement, hence the importance of control of hypertension and we have addressed to these complications and the approach to this complications as a special situations in our guidelines and we have seen the need of these special situations where so many trials have come up recently; in various fields like kidney, the diabetes, elderly, cardiovascular, metabolic, lipids all these have been covered in the Indian Guidelines on Hypertension and the cardiovascular disease are responsible for 30% of deaths worldwide. What do we have in these guidelines is that new epidemiological data is now available in the last 5 years and this has been included and reflects the increasing prevalence and poor levels of control of hypertension in India. This is the quote from the guidelines that in last 5 years there is a lot of data, lot of trials, lot of epidemiological survey’s and lot of data on kidney diseases that have come. A focus is on the recent guidelines of kidney disease that have been included in the guidelines and that is why definitely there is a need of Indian Hypertension Guidelines which also says that there is an increasing prevalence and a poor level of control, this has been focus of the guidelines of control of hypertension in India. Then, the other emphasis is that in the newer guidelines that compared to the second guidelines is, the treatment of hypertension even in octogenarians. You will see that the life span of individuals in India is increasing. It was 50, went up to 60, now we have healthy individuals at the age of 70 and 80. So, that is the focus and that is why we had the new edition of the Indian Hypertension Guidelines, more than 8 years, and is shown to be beneficial by the newer data and has been recommended, so importance of treatment of elderly, which we already discussed yesterday. This is the mortality figures in the various parts of the world and disability due to the hypertension. Also the higher burden in the younger population. I was discussing with Mr. V. S. Joshi, he was emphasizing, he gave me example of one of his friends who saw almost 25 new onset myocardial infarction patients with hypertension in the last 3 months, 32 patients am I right? Myocardial Infarction, Hypertension at the age of 32, so this has been deliberated by our core group and the higher burden in the younger population more than 80% of the attributable burden of disease was in low income and middle income regions and the greater proportion of burden was in the young age groups in these regions that is than it was in a high income region. The hypertension does not see the barrier between high income and the low income group. This was even brought out by Lancet. In India an estimated 50% of the cardiovascular deaths occur below the age of 70 compared with 23% in developed countries. This was a very important focus, what is our perception about hypertension? 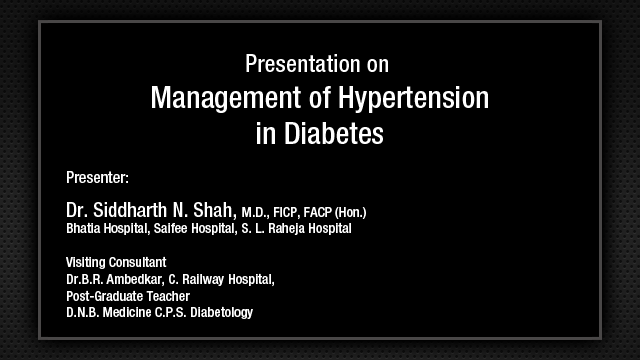 All physicians treat hypertension, but what is our perception. A qualitative study done amongst migrants in Delhi in 2008, I think Dr. Kaul will mention about this, hypertension has been perceived as a common and serious problem, ambiguity prevails over perceived symptoms. It may be asymptomatic. Awareness and knowledge about hypertension and its consequences are inadequate, so Mr. Joshi is on my back to do away with this and increase the perception and knowledge of hypertension and there was a felt needed for awareness campaigns and mass screening programs. 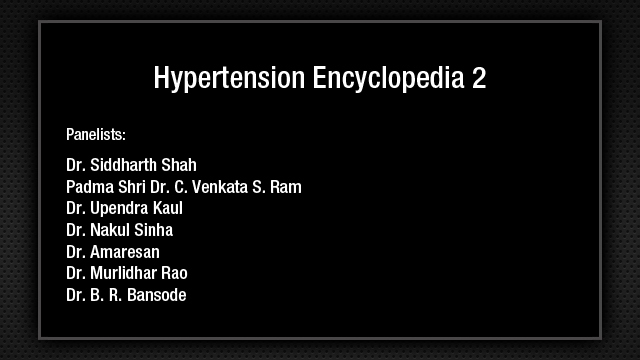 Unanswered points in hypertension in India. Well, yesterday we had a full lecture on measurement of blood pressure, instruments to be used, epidemiological studies, this has eluded into the new guidelines, lot of epidemiologic data has come forward and we have included in our data. Inadequate treatment, perceptions about treatment, what does a patient feel about. You write a prescription and the patient takes home the prescriptions and he disappears. He comes back to you after two years, sir, but you never told me to continue this treatment. He feels better after a month, takes treatment for blood pressure and he comes with a heart attack after 2 years saying I never knew I had to continue the management or taking treatment for hypertension. So, perception has to change. Impact of treatment unless you follow these patients up, you will not know whether you are reaching the goals and these goals have been amply emphasized in the newer guidelines on hypertension. This is quote from the Indian Guidelines, for follow-up of the patients. While in second Indian Guidelines, use of home monitoring of blood pressure was discouraged, however, with the availability of better devices and newer data showing its usefulness for follow-up of this patient, this is now encouraged. This is the difference between the second and third, our perception also amongst the core group 5 years ago and today. We say that have home blood pressure monitors. Just like in diabetes you have home blood glucose monitoring you must have home blood pressure monitoring at least for the patients to know what about the disease and get back to their physician if they have any difficulty. This will encourage them to even take their medicines appropriately. This is one of the old slides, this has been covered yesterday, but just to talk about the 1940s we had potassium thiazide, Kempner diet, and lumbodorsal sympathetectomy. This was a treatment of hypertension. Yesterday Dr. Bansode, you talked about those times when we used to have those centrally acting drugs and used to manage the blood pressure and why do we need 4 drugs today, how have we gone on. In 1950s, we had rauwolfia serpentina, ganglion blockers, veratrum alkaloids, hydralazine, guanethidine, and thiazide diuretics. Over 60 to 70 years thiazide diuretics still remains and whether the perception of changing it toward to chlorthalidone, still remains an enigma and this has been pointed out by the newer guidelines, the use of chlorthalidone. What was perceived 5 years ago in the second guidelines was at that time chlorthalidone was not available. We did recommend chlorthalidone, but it was not available, 2 years now chlorthalidone is being available and data have come in showing the superiority of using chlorthalidone over thiazides. Then, in 1960s we had methyldopa, spironolactone and the advent of beta blockers. We had a lot of discussion yesterday about the use of beta blockers. In the 1970s, we had alpha-1 adrenergic receptor antagonist and the ACE inhibitors. The ARBs and ACE inhibitors now remains the drug of choice for control of hypertension. In 1980s, calcium antagonist came in. In 1990s, angiotensin receptor blockers and endothelial receptor antagonist came in. In 2000, rennin inhibitors had its way and now we have what is in 2010 onwards the renal sympathetic denervation, some of which we have discussed yesterday. This is the march of antihypertensive therapy over the years. This has been eluded to in the guidelines. Well, the importance of recognizing orthostatic hypotension, which was not given that much importance in the second guidelines, has been given a thrust about the orthostatic hypotension and its clinical implications, the importance of recognizing it and controlling it. The debate about the value of beta blockers as the first line agents in hypertension, I am sure the JNC 8 will definitely elude to this and bring down the beta blockers along with the others as far as the second line of therapy is concerned. They are definitely going to talk about the diet and exercise, the lifestyle treatment of hypertension, but the second line is definitely not going to be the diuretic and beta blockers, so this has been discussed and has been amply debated and put down in writing in the Indian Guidelines on Hypertension - 3. I am sure you will definitely look at the various recommendations of Indian Guidelines, because it definitely gives you the value and the implications of various changes that are happening in different parts of the country. Especially in India itself, north and south diet is different, east and west is different, the climatic conditions are different, the intake of oils, the intake of salt, everything is different in different parts of the country. This has been taken into consideration in the Indian Guidelines on Hypertension and that is why the need for Indian Guidelines on Hypertension, I am sure in future we will allude to our Indian Guidelines rather than wait for JNC 8. There are new recommended agents for use only in young hypertensives and specific indications. Beta blockers, yesterday we discussed in young hypertensives who still would like to use beta blockers, postmyocardial infarct, you would like to use beta blockers and for routine patients these are no longer recommended as first line agents. This is a specific statement that has been made, I am sure it is going to create a lot of debate as Dr. Venkat Ram pointed out yesterday. He is going to talk about beta blockers in the ACC I believe and let us see what comes out, but this is what is recommended that for routine patients these are no longer recommended. There are subsets of patients where beta blockers are indicated and that is why we need the Indian Guidelines on hypertension. At the time of second guidelines, it was felt that lower the better policy for target blood pressure was preferred, however, it has been realized now that the J shaped curve does not exist specially for non-revascular coronary artery disease patients and caution has been advocated in trying to lower blood pressure to low target levels especially in these patients. Diuretics have also been discussed threadbare in the third guidelines. Diuretics are now considered at par with ACE inhibitors and ARBs and calcium channel blockers and not as preferred agents as in previous guidelines. Chlorthalidone is now available and shown to be better than hydrochlorothiazide and its usage is to be preferred, this is a recommendation. This is again what we all know, but we will like to emphasize in our guidelines that when blood pressure is high by more than 20 mm systolic or 10 mm diastolic, it is now recommended to start with combination of drugs. We had a full session on combination of drugs yesterday. Monotherapy is not going to be effective in achieving target blood pressure. Certain combinations have been shown to be better than others in recent trials, especially ACE inhibitors ARBs in combination with CCBs form a good combination. This has already been discussed yesterday and this does come in our guidelines. Chronic kidney disease is now recognized as a common comorbidity and has been explained. Awareness and diagnosis of this entity will help recognize the high risk hypertensive individuals. This part of the special situations of kidney disease has been very well taken up in the Indian Guidelines on Hypertension where we have also taken up the recent recommendation of the kidney guidelines. Approach to hypertension and kidney disease has been revamped and KDIGO Clinical Practice Guidelines for management of blood pressure and kidney disease have been included. I think this will be taken up by Dr. Amaresan in the following lecture. The health related toxic effects of mercury are recognized worldwide and mercury sphygmomanometers are being replaced by aneroid and digital sphygmomanometer. We heard about this yesterday, but this is what is recommended in our guidelines. We are looking at the future, even not waiting for the fourth guidelines. I think by that time we will have some guidelines, because the Government of India has also now cautioned people against the use of mercury manometers, though yesterday we discussed it is a gold standard. We intend to emphasize that the change is inevitable and Indian physicians should also move towards using these devices and wean off the use of mercury sphygmomanometers, these are guidelines. I am sure things will roll all over the world and in India also. The term heart failure with normal ejection fraction need to be recognized by physician and has been mentioned and explained for use in clinical practice. Heart failure with normal ejection fraction is common among elderly hypertensive individuals and is diagnosed on the basis of symptoms of dyspnea, raised BNP levels and diastolic dysfunction on echo with normal ejection fraction. This is the important part of the heart involvement, a new form of nonpharmacologic interventional, sympathetic denervation therapy has been discussed by the guidelines by the core group and the statement has been made . They have said that we do not recommend this, but we will look at the future how this therapy is going to take up. Whether it will be a common therapy for resistant hypertension, time will tell. This has become recently available and is being evaluated. Its place in treatment of these patients will evolve over a period of time, this is the statement. You can realize the number of statements that we have made with lot of thought without expanding. This not a text book of hypertension. We are only recommending guidelines of hypertension to each individual physician. How to take it up, it is up to physicians, after knowing the basis of this guidelines and we recommend that these guidelines be used and circulated to the physicians of the country.